Guys, I might have done something very foolish — I accepted my boyfriend's challenge to be sugar-free for the entire month of February. 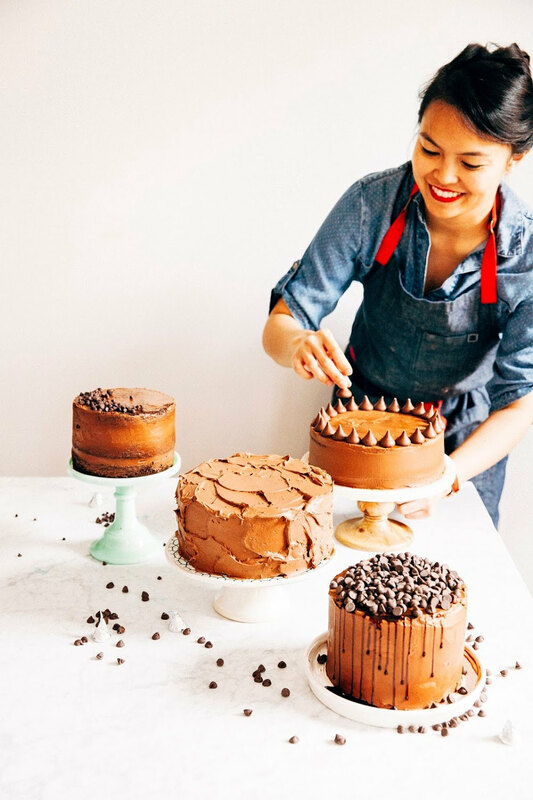 I know, I know — a sugar-free dessert blogger? How is that possible? Is that even possible? I don't know, but I must admit, my sugar cravings have started to get out of hand. I get cranky when I don't eat something sweet after every meal... breakfast included. That's not normal, right? The rules of this month are simple. I'm quitting refined sugar for the month of February. That is, granulated sugar and confectioner's sugar are big no-nos, but natural sugars from things like fruit, honey, agave, are okay. As difficult as it is to avoid refined sugar (seriously, it's in everything and I'm starting to get MAD cravings), I'm actually excited to be experimenting with alternative sweeteners like fruit and honey. While I've made a ton of baked goods using both fruit and honey before, I've never made them without the help of refined sugar. It'll be interesting to see how this works out for my baking. Wrap the cheese and herbs in a small square of puff pastry, throw in the oven, and boom! One of my favorite snacks of all time. Nothing but melty, buttery, cheesy goodness. 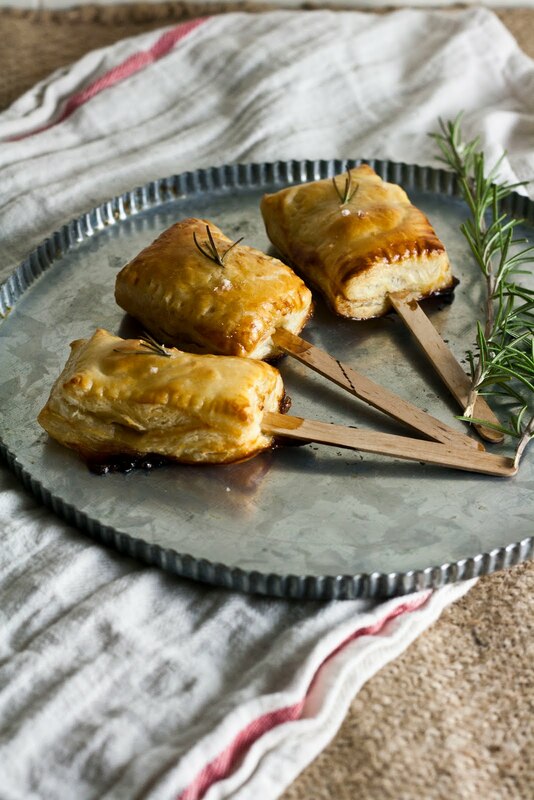 I loved, loved, loved the idea of using popsicle sticks to present the pastries — puff pastries can get a little greasy, but the popsicle sticks really solved that problem. These pastries are best when served immediately from the oven, with a drizzle of honey and a light sprinkle of salt. Place a rack in the center of the oven and preheat your oven to 375 (F). Cut 2 frozen puff pastry sheets into thirds (most store-bought frozen sheets come frozen and folded in thirds already, so just cut along the folds) to get three panels. Cut each panel into four 2 1/4-inch tall and 3-inch wide rectangles. Cut each rectangle in half. You'll have 24 little rectangle pieces that will create 12 little rectangle pockets. In a small bowl, combine 1 large egg with a splash of milk, whisking together until the egg is beaten and the milk has been incorporated into the egg. Brush 12 of the small rectangles with egg wash. If you're using popsicle sticks for serving, place a popsicle stick halfway up the press pastry and press in gently. Place a small sliver of brie on top of the egg wash and stick. Top with 1/2 teaspoon honey. 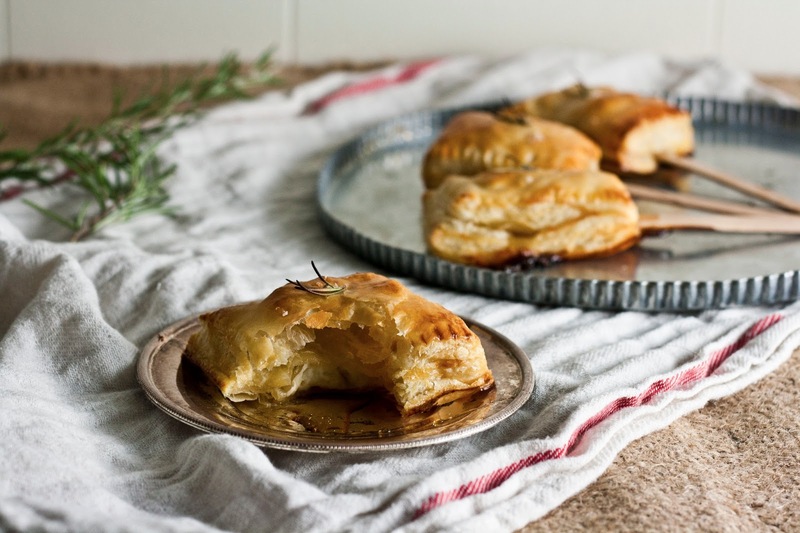 Tear a couple rosemary leaves off from your sprig and sprinkle them on top of the brie and honey. 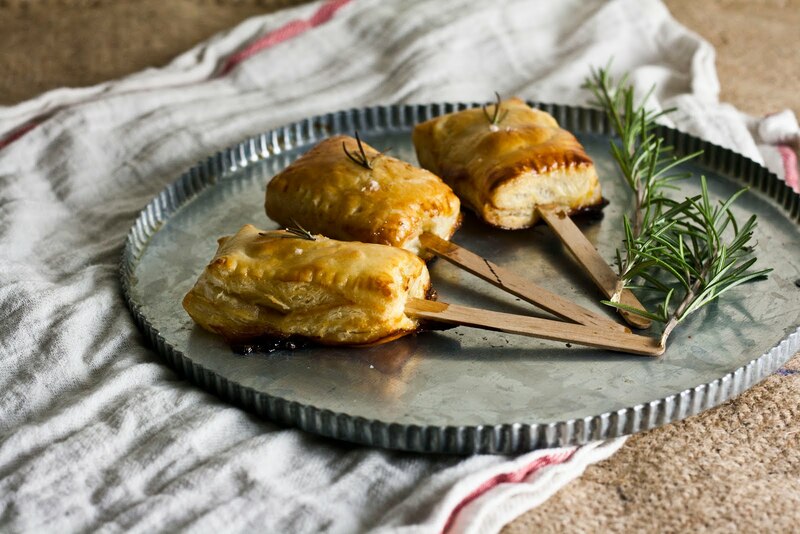 Take another puff pastry rectangle and place on top of the cheese, honey, and rosemary using a fork to press the edges together by crimping them. Prick the top of the square lightly with a fork. Repeat until you have 24 pastry squares. 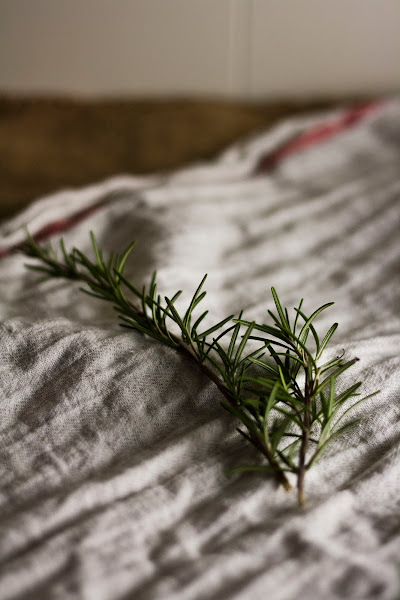 Place prepared bites on a parchment-lined baking sheet and brush the tops of each pastry with remaining egg wash. Sprinkle with a touch of coarse sea salt and another couple sprigs of rosemary. Bake in the preheated oven for 12 to 14 minutes, or until golden brown. Remove from oven and allow to cool slightly before drizzling with honey and serving immediately. Bites are best served warm. These would have been great for the cocktail party that I had. I will have to keep this recipe for the next time I have people over! 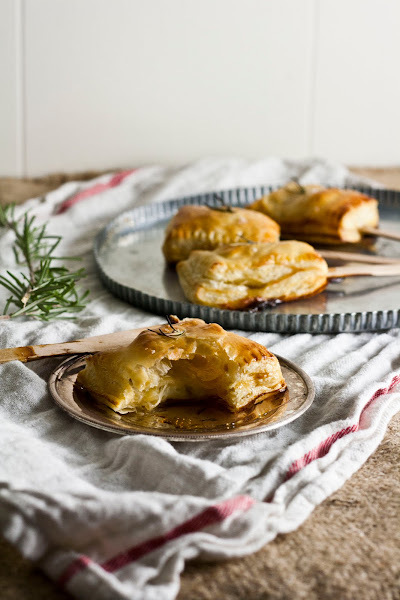 Looks Delish, I love baked Brie. Fantastic! But how do you incorporate the rosemary? And wouldn't some bare rosemary stems make nice "sticks"? Just an idea! OMG how embarrassing I totally forgot to put a key step of the recipe in there. Thanks for catching, I'm updating the post now. Wooo! I just went through my own sugar-free challenge! I started with a week, and then decided to do Whole Living's three week detox, so I'm entering my fourth sugar-free week! It was SUCH an adjustment (I really do think I had a mild sugar addiction) but I feel really good. Like, I'd love to not go back to eating sugar. Although I totally will. 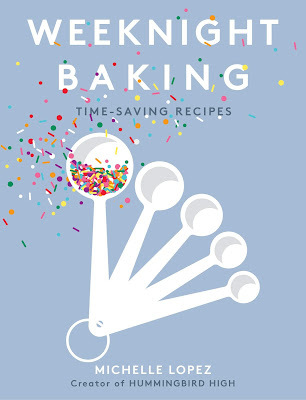 But I think it's awesome that you've committed to it and I am so excited to see what you bake up in the meantime!